Cuba is no longer dragging its heels when it comes to tourism, new figures suggest. For decades the politically adrift Caribbean island has been uncommercialised. But Barack Obama's visit there last week has sparked a further huge jump in the number of holidays being considered there. Tourists are eager to explore Cuba's old school charms before it becomes westernised. This continues the trend since December 2014. Britons have been flocking there since steps towards relaxing the long trade embargo were initiated in that month. British tourists eager to explore Cuba before the chain stores roll into town can give themselves peace of mind by taking out trusted travel insurance. This gives them protection should the unexpected happen, such as lost flight tickets or documentation, missing luggage and stolen souvenirs. UK tourists may have to display patience, however eager they are to get a slice of Castro's Cuba before more western influences take over. 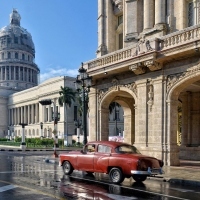 Press Association writer Sarah Marshall says there is no guarantee that booking tomorrow will mean travellers will be able to see the old Cuba in the immediate future. She claims this could take months in some cases as supply struggles to catch up with the growing demand. But Cuba's expansion plan to cater for the rise in numbers is well under way. Melia Hotels International, for example, says it will accommodate thousands more holidaymakers with three additional planned sites bringing 2,000 extra rooms.